Your lawn & garden are an extension of your home, and maintaining your lawn & garden can require a lot of attention. That is why Fox Plumbing & Heating offers professional sprinkler and irrigation installation services to our Seattle and King County neighbors. Your lawn is a great place to enjoy long summer days, to play and host outdoor barbeques for your friends and family. And even though we're known for our rain, we do have changing seasons that can damage or even kill your lawn & garden. That's why having a professional help ensure the beauty of your lawn is so important. Fox's professionals will provide you with suggestions and recommendations that can help you keep your lawn & garden looking beautiful all year round. We offer a "State of the Art" system, that will help to eliminate the cost of lawn care maintenance by installing fertilization and automatic pest control. The only thing that Fox can't do is mow your lawn and pull the weeds. This is just one of the many ways that "Fox Thinks Out of the Box!" That means that you don't need to worry about digging trenches or disturbing your rockeries, patios, stairways, mature plants, shrubs, trees or existing beautiful landscaping work! 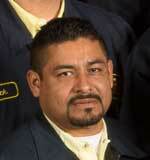 Jose leads the Trenchless Technology team at Fox Plumbing & Heating. He has over 10 years experience running and leading trenchless water line installations for Fox. Jose is one of the most skilled trenchless water line professionals in all of Washington, and the best you'll find in Seattle and King County. He will ensure that you're lawn is just as perfect when he's finished as when he began adding your new irrigation or sprinkler system. "Four hours start to finish! I couldn't have dug two trenches in that time. They are a very professional and efficient crew! Thanks, Fox Plumbing & Heating!" Fox Plumbing & Heating ensures that installing a sprinkler or irrigation system won't wreck your landscaping with our Trenchless Technology System. Fox Plumbing & Heating uses our system to tunnel under your beautiful gardens, driveway, patio and/or lawn to safely install new water lines, sprinkler systems, fountains or garden faucets. Let us help you by ensuring that your lawn and gardens stay perfect all year round. Our process can be as quick as four hours from start to finish. You won't even know that we have even been there. Just think, a totally automatic outdoor sprinkler system that knows when to turn your water on and off, for each and every zone of your property. With our 'State of the Art' Automatic Dosing System, you can forget about having to always fertilize and fumigate for bugs and insects. Fox Plumbing & Heating Professionals are always ready for your call. Our teams are fully stocked with the tools needed to service your plumbing, heating, A/C or sprinkler and irrigation system needs. Fox is a one stop service and installation company for your lawn, plumbing, heating, or water needs, that’s why we say, ‘Think Out of the Box… Talk to Fox!’ Located at 7501 2nd Ave. S, Seattle, we’ve been servicing all of Seattle and King County for over 50 years, and we’re looking forward to servicing all your needs for the next 50 years!